PTCL has signed an agreement with ADG LDI (Pvt.) Ltd to promote its Wireless Local Loop services across Pakistan. Mr. Hamid Farooq (SEVP Business Development), PTCL and Mr. Farooq Dar (CEO) ADG LDI (Pvt.) 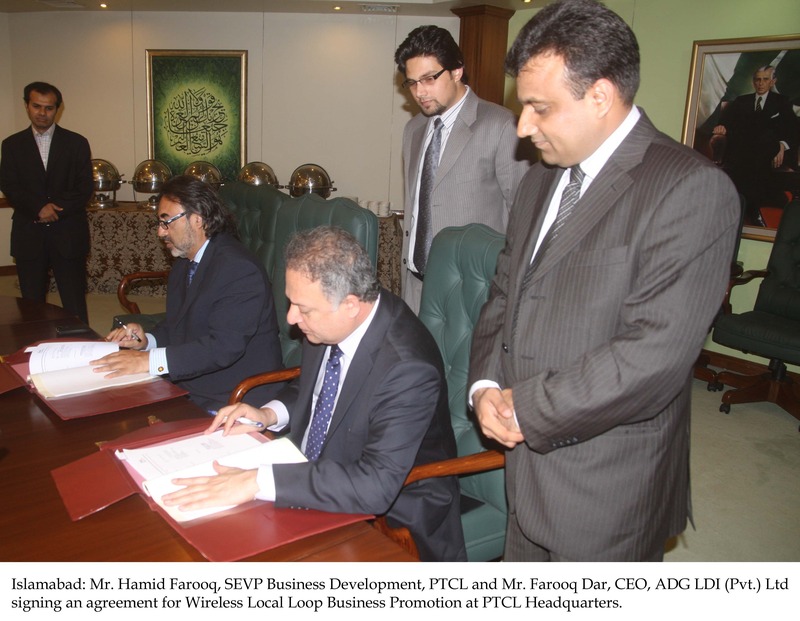 Ltd signed the agreement in a ceremony held at the PTCL headquarters. ADG LDI (Pvt.) Ltd, a company of the Dollar East Group is a premium provider of telecom services and solutions with expertise in diverse areas and is operating a network of voice and data services with presence in major cities of Pakistan. PTCL is the largest integrated telecommunication services provider in Pakistan and has been offering voice and data wholesale WLL services to prospective Virtual Network Operators (VNO). These VNOs use the PTCL network infrastructure for end to end service provisioning and use their own retail brand and sales & distribution channels to market these services to their target customer. The resellers can customize their product-line to cater to very distinct segments of the market. “Wholesale partnerships like these make a difference to our business. We are pleased to sign this agreement with ADG LDI (Pvt.) Ltd which will strengthen our wholesale product portfolio. “Keeping in mind the needs & requirements of end users, ADG LDI (Pvt.) Ltd has joined hands with PTCL as a Partner in WLL Operations. I am sure, with the grace of Allah, both companies can jointly make Wireless Local Loop business a success story in terms of penetration & customer retention. Penetration on the ADG side & retention through Quality of Service provided on the established WLL Network & Infrastructure provided by PTCL. Apart from this project, ADG LDI (Pvt.) Ltd has ambitious plans for consumer telephony market with a number of unique & value added telephony services products to be launched in due course. I hope this venture will add valuable impact on both entities reach & visibility, Insha Allah”.